The oldest part of Villa Policreti dates back to 1500 a.d. and is one of the most significant historical site, with the remains of the castle, and the church of San Gregorio, both located in Aviano, Villa Policreti’s town. Thanks to a careful restoration which has respected and enhanced the original feature and restored some architectural details that were lost, the old building has regained its splendor. Floors of great value, in granulated original Venetian or wood, wood beams, decorations and wall writings, marble bathrooms, antique furniture , confer to Hotel Villa Policreti an aura of elegance, sophistication and originality. 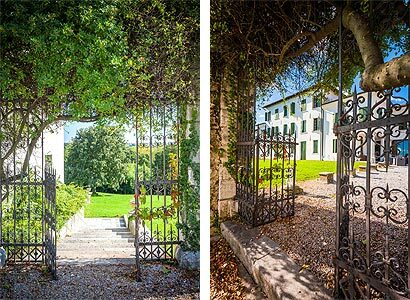 Surrounded by one of the most beautiful parks of Friuli, 320 thousand square meters of meadows, Hotel Villa Policreti and its panoramic and quiet site, overlooks the luscious green of the prestigious golf course of the Golf Club Castello d’Aviano.